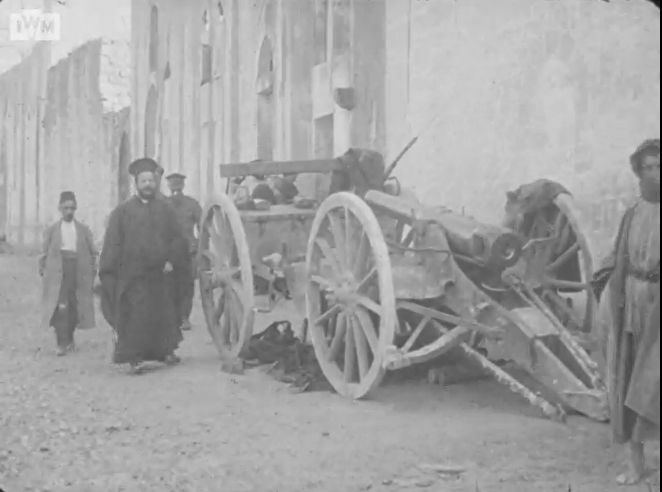 Over Open Sights: WW1 Obsolete Ottoman Artillery. Military Miniatures painted by Mark Hargreaves. opensights.over@gmail.com Figure Painting Commissions undertaken. Please email for details. The 88mm Krupp K73 (produced by Victorious Miniatures in their 28mm Boxer Rebellion range) being crewed by figures from Woodbine Designs and Perry Mniatures. The Perry figures are Egyptian gunners from their 28mm Sudan range with headswaps. 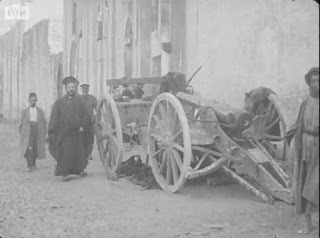 Guns like this, captured from the Turks, can be seen in the film "The Occupation of Es Salt" in the Imperial War Musuem online collection. I attach a screenshot from that film. Beautiful paint job once again on these Turkish gunners. I look forward to seeing all these wonderful figures and vehicles in action on a table one day! Artillery Spotters for "Setting the East Ablaze".